This week's Designer's Choice Challenge 226 at the Repeat Impressions Blog is to use Black and White and One Other Color. 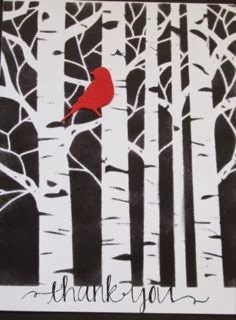 I used a birch trees stencil from Crafter's Workshop and Hero Arts Black ink applied with a sponge dauber to create the background on a white card. I added a sentiment at the bottom also stamped in black. I used a Memory Box die for the pop-of-red bird.